"Being the tour guide around here just got a lot harder." The saga of Project Soul Hunt continues. Like many sagas, however, this one is getting quite complex. After the unfortunate events of the last volume (in which the Emperor ordered the death of his own wife under the influence of the demon mistress, Dakki), Lord Kou Hiko is now on the run with the two princes of the Yin Dynasty. Dakki has come up with a clever plan: she doesn't have to do anything anymore to stop Hiko: Lord Bunchu will do it for her, vowing to kill Kou Hiko because of a perception that he has abandoned the Emperor in his time of need. There's also some new characters to deal with, including Kou Hiko's own son, Tenka, who is rather talented with his weapon of choice�a lightsaber. As the disc begins, Kou Hiko is hoping to escape with the two princes on his planned route. Taikoubou, our "hero," wants to help but isn't sure where to start. In the meantime, Tenka rushes to meet Kou Hiko and the whole thing is heading towards a meeting of demons that will be extremely dangerous. Little do any of our characters know that there are two demons with impressive powers waiting to meet them. One carries a Paopei (special magic wand) with the ability to paralyze people; the other carries a set of beads that can eat up and entrap people Pac-Man style. To make things worse, Taikoubou, Raishinshi, and the rest of those from Heaven are starting to fight one another, getting to the point where they no longer want to travel together. This newfound complexity doesn't weigh down Soul Hunter, though; if anything, it thrives on it. I think there would come a point where Taikoubou's antics would probably start to wear thin were it not for the series taking a more serious tone. So, here we have a much more concrete plot and more characters with real intent. There's still plenty of room for the characteristic humor that's great about the show, but it's skillfully put into a certain niche. Unquestionably, things are going to start taking a much different turn in the next volume, simply because the secret is basically out about who each character is and what he's doing. To be honest, even though I think the show is very strong, it can't go on much longer as simply a quest to destroy the demoness Dakki. It will start to get old unless some major changes are made to the flow of things. I hope either the series ends soon or changes focus. 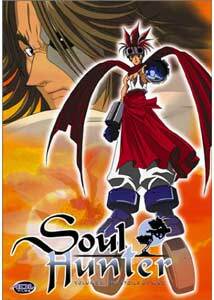 Beyond those potential problems, though, Soul Hunter seems to get better as it goes on. It is amazingly weird and slapstick one moment, then amazingly dramatic and tragic the next, meaning it offers a wide variety of emotions to experience. Image Transfer Review: Like previous volumes of the series, Soul Hunter often switches between cel-animation and computer enhanced footage. The traditional animation is good, but a bit grainy and seems to suffer some blurriness at times. This must be a source issue, however, because every time the computer enhanced scenes comes on, the transfer takes a leap into being virtually perfect. There are basically no complaints here, but the constant switch between animation styles is a bit jarring and I'm surprised the filmmakers did it this way. Audio Transfer Review: The 2.0 Dolby audio is pleasant and fitting, never getting too elaborate or wild. There's some subtle surround effects (or stereo effects that feel very surrounding), but not much. There isn't much directionality, but there's a nice, clean feel to the audio and no details are obscured or lost to any others. The English dub is basically the same and, for a dub, is of good quality with well chosen actors. It seems unnatural, but it works better than most. Character Descriptions and relationship tree. Extras Review: The extras include the usual group of supplements designed to help people understand the series better (character descriptions, explanations, and relationship tree) as well as understand the Japanese terminology. Many of the phrases and more obscure words are explained in detail, as is their treatment in the dub and subtitles by way of the translation notes. Thanks to this copious work, virtually anyone should be able to follow the show easily, despite the myriad of characters, historical references, and Japanese supernatural terms. Soul Hunter remains a creative and interesting series about some fascinating, and often funny, characters. It tells a dramatic, epic story of good and evil in a very casual and clever way, making it very accessible compared to most anime.